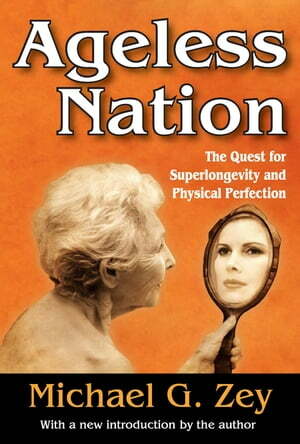 Collins Booksellers - Ageless Nation by Michael G. Zey, 9781351533256. Buy this book online. In this intriguing volume, futurist and author Michael G. Zey imagines a time in which technology has stretched human life spans to four hundred years or more. Genetic engineering, cloning, and stem-cell technology will eradicate diseases and allow for nanoscopic repair and maintenance of the body. "Smart drugs" and caloric restriction programs will largely stop aging and ensure healthy bodies and sharp minds indefinitely.Grounding his speculation in contemporary scientific research, Zey's optimistic vision sees retirement replaced by hiatuses between careers, and leisure time spent in multi-generational homes. Key players in the debate include supporters like Cambridge University scientist Aubrey de Grey, who envisions five-thousand-year life spans, and the radical futurist author Ray Kurzweil, who foresees the merging of humans and computers. Organizations such as the Coalition to Extend Life lobby the government for immortality research funding and find opposition in the President's Council on Bioethics and "deep ecologists" advocating zero-population growth.Criticizing current environmental trends as anti-progress and anti-human, Zey's own solutions include controversial measures like human control of weather, colonization of outer space, and genetically modifying food. He concludes that the eventuality of a modern Fountain of Youth is closer than we think. Zey's predictions about the future are thoughtful and fascinating.